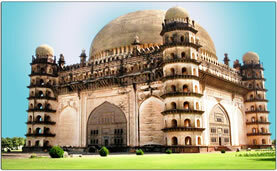 History has been benevolent to the city of Bijapur. Very few places across the world come close to the profound historical significance of this magnificent town, where so many dynasties ruled for centuries together and left behind their indelible imprints, forever. Bijapur has truly seen it all. Between the 10th and the 11th Century AD, Bijapur’s foundations were laid by the Chalukyas of Kalyan. Originally christened as Vijayapur or the ‘city of victory’, this famed the north Karnataka town later came to be known as Bijapur. Towards the end of the 13th century, the city came under the suzerainty of the famous Muslim ruler Allaudin Khilji. This was the period of unprecedented architectural development in Bijapur. The ‘golden age’ of architectural and cultural renaissance flourished further under the Adil Shahi dynasty. In 1686, Bijapur became a part of the Mughal Empire, under the reins of Aurangzeb. It is only natural for a city immersed in such diverse and rich history, to be one of the prominent tourist destinations of the country. However, in modern times, Bijapur, with its uncanny ease donned the mantle of a bustling cosmopolitan city. Apart from the famed Golgumbaz and numerous other magnificent monuments within the city, other places of historical significance, close to Bijapur include Badami, Aihole, Pattadakall, Shivayogamandira, Kundalasangama and Hampi.